DR. LAVIGNE IS Accredited by the American Academy of Cosmetic Dentistry. Accreditation through the American Academy of Cosmetic Dentistry serves to set the standard for excellence in cosmetic dentistry. Achieving accredited status requires dedication to continuing education, and clinical case presentations demonstrating the ability to execute exceptional dentistry. After a four year journey that included a written examination, clinical case submissions evaluated by a board of examiners making up some of the nation’s top cosmetic dentists, and an in-person oral examination, Dr. Lavigne is proud to be the first and only female accredited cosmetic dentist in the state of Massachusetts. She is one of 5 accredited dentists in the state, and one of just over 400 in the world. When I started the process of accreditation, I thought I was a really good cosmetic dentist. I had already gained a reputation in New England for esthetic dentistry, and I felt confident in what I could offer my patients. Accreditation taught me to evaluate my work on an entirely different level. It was a humbling realization that I still had a lot to learn, but one that brought me all over the world seeking the expertise of the best and brightest. Dr. Lavigne after passing one of her final clinical cases for accreditation as a cosmetic dentist through the American Academy of Cosmetic Dentistry. 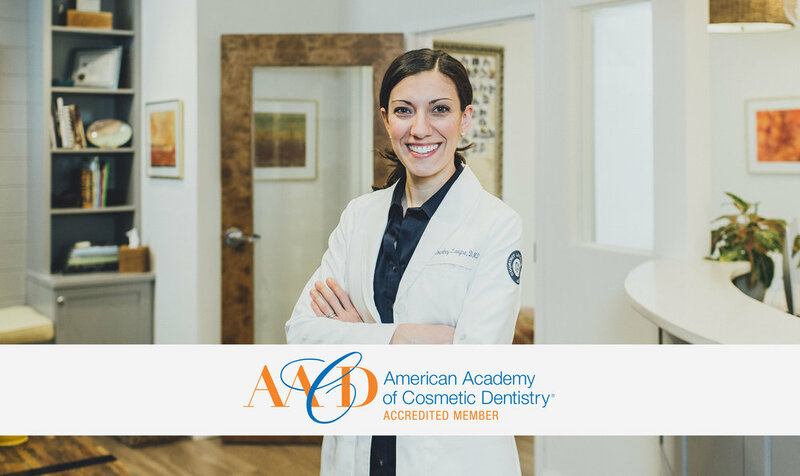 To learn more about the American Academy of Cosmetic Dentistry and to view Dr. Courtney Lavigne’s profile, please follow this link or click the logo below.